Bexhill United's footballers well and truly found their scoring touch to record their biggest win of the season so far. Having scored just once in their previous two Macron Store Southern Combination Football League Division One games, the Pirates ran out convincing 5-1 winners at home to Billingshurst on Saturday. Joint manager Ryan Light said: "It was a really good performance and a very important three points. Football-wise it's definitely up there (with Bexhill's best displays of the campaign). The way we moved the ball and our movement were a joy to watch, and Billingshurst couldn't live with our tempo." Bexhill got off to the perfect start with a quick-fire opening goal. Matt Cunnington ran at the away defence and after skipping past two defenders, was brought down by a third for a penalty after just 47 seconds. Craig Ottley made no mistake from the spot. Light felt that going in front so early was just what Bexhill needed, giving them the freedom to express themselves. They doubled their lead thanks to an exquisite individual goal from Cunnington in the 21st minute. After turning his marker on halfway, the classy Cunnington dribbled to the edge of the area, danced his way through three players and then beat another defender as he went across the six-yard line before slipping the ball past the goalkeeper. Bexhill remained two-up at half time and they began the second period like a train, passing the ball extremely well. Kyle Holden was breaking everything up, which allowed Gordon Cuddington and Wayne Giles to play. Billingshurst pulled one back, however, totally against the run of play. A free kick at the end of a rare forward foray from the visitors managed to squirm its way in, with Kai Bichard claiming the goal. Bexhill weren't themselves for the next five minutes or so, but soon got back on track and restored their two-goal cushion when a lovely sequence of passes on the edge of the box was capped by a great finish from Giles into the far corner. 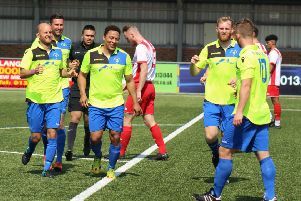 Giles' first goal of the season was greeted by the biggest cheer of the afternoon, with many of the crowd aware that Giles had spent the previous Tuesday night in hospital after suffering breathing difficulties late on in the goalless draw against Seaford Town. Giles, in fact, produced his best performance of the season and was Bexhill's top performer in just about every department according to some statistical analysis the club had carried out on the day. After that it was enjoyable for Bexhill as they cruised to victory in impressive style. Kevin Barden made it 4-1 with his first goal of the campaign after Giles beat his man in the box and played the ball across to the far post. Bexhill weren't done there and they added a fifth goal courtesy of another Ottley penalty following a foul in the box. The full-back is now Bexhill's leading scorer this season with five goals, all of them from the spot. Bexhill: Rose; Robertson, Kidman, McFarlane, Ottley; Gouet (Wheeler), Holden, Giles (Willis), Cuddington, Cunnington; Barden (Shelton).